Ryan Walsh cruised to the fifth defence of his British featherweight title with a decision win over Reece Bellotti. The Norfolk man dominated the 12-round battle in London, and was never really troubled by 'Bomber' as he scored a 116-112, 113-116 and 116-112 split-decision verdict, one judge bizarrely giving Bellotti, who loses for the second time in his career, the nod. The 32-year old champion came out of the blocks firing, quickly wheeling in two big right hooks, Bellotti appearing nervous and his face reddening as 'Iron' forced him towards the ropes. Walsh got the better of the jab battle in a comfortable second round before again swinging in some cuffing shots in the third to stay in control, the Watford challenger - despite a heavy left hand glancing the target - remaining tentative and struggling to get in range. 'Bomber' started to slightly grow in confidence in the rounds that followed, letting his hands go up close with some sharp salvos, but still the defending champion remained on top behind a potent jab, switching stances to land sharp hooks. As the clash reached its second half, Bellotti landed a flush right hand to begin a committed and charged-up spell, a heavy right-left also landing clean in a better seventh, his best round of the fight. The rallying change in tactic forced Walsh to meet fire with fire up close in the eighth as the pair exchanged heavy body blows, the champion's shots still the more vicious though. A huge right to the temple then buzzed Bellotti in the ninth, the challenger suddenly wilting and staggering around the ring, but gamely surviving to hear the bell. 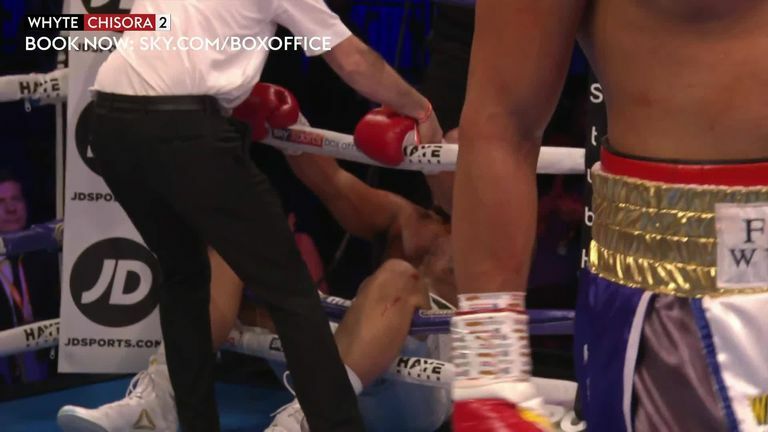 Fabio Wardley knocked Phil Williams out of the ring to end their early undercard bout! After the pair eased off in the 10th, 'Bomber' gave it his all in the penultimate period, pouring it on and planting his feet to land some sinking combinations. Walsh, though, never really appeared hurt and fired back in a pulsating last, both men landing heavy thuds in an electrifying final three minutes. Earlier in the night, Fabio Wardley and Linus Udofia both extended their unbeaten records with dominant wins.